Starters ordered will be shipped the next business day by USPS Priority Mail or UPS. Large orders may qualify for a discount and may not qualify for next day shipment. If you do not know what lamp you require or for lamps not listed, email your request or call 336-882-2854. To order, please use our secure shopping cart above or call 336-882-2852 or 800-692-3051. 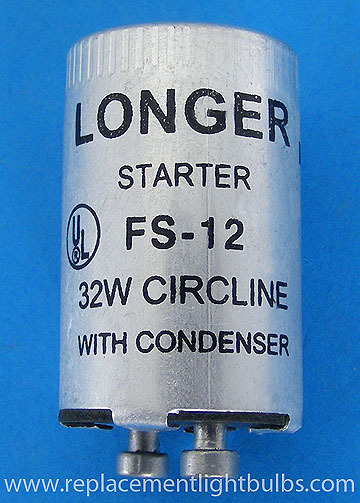 FS-12 Aluminum Fluorescent Starter For 32W Circline Fluorescent Lamps. For use with FC12T9 Circular Fluorescent Lamps and F22T8 Preheat Lamps.